An app at the Google Play store turned out to be a fake, which surprisingly was one of the most downloaded app with around 10,000+ downloads. 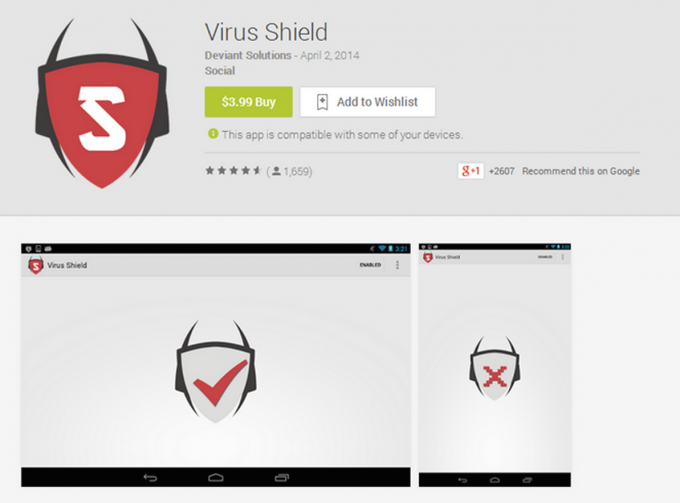 Android Police reported that the premium app priced at $3.99 – Virus Shield, is nothing but a fake app. Coming with a price tag of $3.99 the app’s description states that it protects the smartphone from a number of malicious attacks and protects your files, but instead Android Police reported that the app changes an image of “X” to one with a check mark. In reality the app has nothing do to protect you from malicious attacks. The app was rated at Google Play store and received some of fake reviews in the past. Android police after dumping the APK came to know that the Java code in it has nothing to do in protecting the users. The snippet was only for changing the images. Although the app after being flagged got removed from the Google Play store, it has already made its way to the thousands of devices. There is no developer in the name of “Deviant Solutions”, instead the email provided revealed that the person has already been blocked at some other websites in an attempt to have a scam. Android apps can be easily uploaded by anyone just by paying a minimal price of $25, Google has provided different ways to protect Android users from such malicious activities, one of them is the bouncer service at the Google Play. This service runs the APK for a limited period of time to see the app is malicious or not, but a few ingenious security researchers bypassed it by delaying the execution of malicious code after a few hours or even days. Google Android also resides a master key vulnerability, which allows anyone to modify an app to include malicious snippets. The more I read from Jamie Hacking, the more annoyed I become with the lies and deception. 10,000+ downloads doesn’t qualify it as “one of the most downloaded app[s]”. Avoid this website; it’s purely sensational with no integrity.